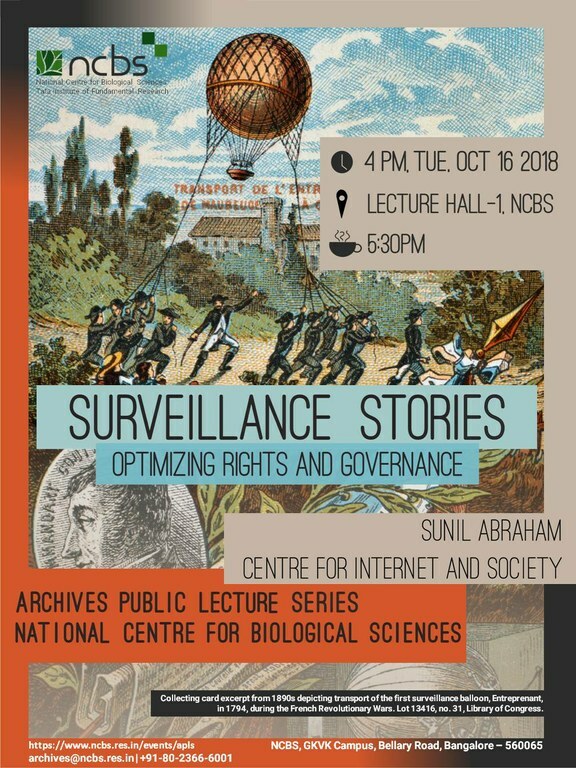 Sunil Abraham gave a talk at the National Centre for Biological Sciences, Tata Institute of Fundamental Research, Bangalore on October 16, 2018. Sunil used a series of stories to explain how surveillance works and fails in the context of theft, murder, insider trading, terrorism, demonetization and encounter killings. These stories were used to explore multiple technical solutions for solving the “surveillance optimization problem”. Policy makers have to simultaneously maximize various rights — the right to privacy, the right to transparency, the right to free speech — and uphold the imperatives of the nation state: national security, law enforcement and effective governance. Two decades ago, Lawrence Lessig introduced a socioeconomic theory of regulation called the ‘pathetic dot theory’, which discusses how individuals in a society are regulated by four forces — law, code or technical infrastructure, market and social norms. The talk will explore how these four regulatory options contribute to solving the surveillance optimization problem.